Beatport has written to labels telling them it won’t be paying owed royalties for the past quarter until its parent, SFX Entertainment, completes its ‘going private’ process. In a letter to music rights-holders sent last night and obtained by MBW, Beatport told labels that SFX’s ‘going private’ procedure had “trapped certain earned label payments”. Beatport, which recently struck an exclusive content partnership with Spotify, believes the process will be “coming to an end in the next few weeks, at which time all payments will be able to be made”. The big problem for the small labels we’ve spoken to is one of cash flow: this blocked payment covers three months of income, from April-June, and was due to be paid last Thursday (July 30). 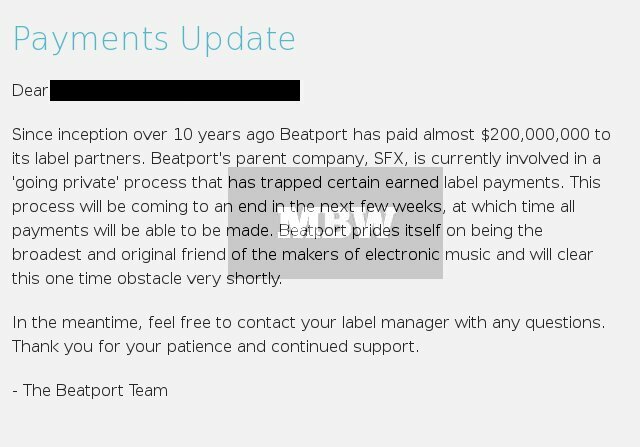 With Beatport accounting for 90% of digital income for some dance labels, such a delay in a primary revenue source risks badly damaging their stability. The owner of SFX, Robert Sillerman, aims to take the company off the US stock market this year by purchasing the shares he doesn’t currently own in the ‘EDM’ specialist. Sillerman is believed to currently own around 37.4% of SFX. SFX has now completed a “go shop” period, in which the company was permitted to solicit acquisition proposals from alternative purchasers. That appears to have led the way for Sillerman to complete his buyback in the next few weeks, which will cost him $774m. However, some now question whether Sillerman is able to raise the funds needed to purchase the remaining shares in SFX. If he can’t, then an asset sale – which may or may not involve Beatport, bought by SFX for $50m in 2013 – would be a possible option to bring down the pricetag of the business.